There are literally knitters sitting in every chair in the hotel bar and lobby attached to the convention center. All in their natural habitat with their WIPs in their laps, hands working away, chatting up a storm (WIP stands for work in progress, for those non-knitters out there.) If you are into the fiber arts, you HAVE to make it to one of these shows. Here are the highlights of my 1-day visit to the marketplace from a knitter/spinner perspective. Theses guys really stepped up their game by introducing support spindles that have a beautiful blown glass feature. They had such a large assortment to choose from too. It was so hard to pick just one. Here’s the gem that I came home with. She looks like a magic wand and spins like a dream! If you missed these at the show, don’t worry, you can find them on their website http://www.mingoandasho.com/ and in their Etsy store https://www.etsy.com/shop/mingoasho. And check them out on Instagram @mingoasho – don’t be shy about contacting them and asking for what you want. They have so much more diverse styles of glass than they show on their store. There’s glitter, spirals, spirals with glitter, these bubbly organic looking ones. You must see them in person. One of the very best things about being a knitter is the community. I have a tight knit (had to make that pun) group of knitters that I meet with about once a month. This year I met up with Marisa (@quiltotaku on IG) and Marianne (@arunningstitcher on IG). They have extra sewing skills that I get to benefit from. Marianne surprised me with a hand made double pointed needle holder with some super cute fabric. Just what I needed for this pair of socks that have been carelessly sitting in wait while I finished another project. See those stitches dangerously close to the edge ready to fall off at any moment! Now they are safe, thank you Marianne! I have a sentimental attachment to Pigeonroof studios since it happened to be the first fiber that I purchased to spin with, and I spun during an extremely difficult time in my life. My dad had passed away and all I could do for days was sit and spin all the best memories into that yarn. It was instrumental in helping me process the grief. So, I’m really looking forward to spinning more fiber from them, in a happier place this time. And just look at this colorway called Andolin. It’s 4 oz of beautiful Organic Polwarth, a fiber I’ve never spun before. Have you heard of this stuff? It is pretty trendy right now with some custom colorways by the amazingly talented Steven Be and Steven West. You can’t miss it if you are on instagram, there is constantly someone new knitting up a shawl or sock with it. They have some bright neon colors in their pallet that is a little out of my comfort zone to say the least, but I couldn’t resist grabbing the a skein of Hedgehog Fibers Sock Yarn in the “Steven Beyond” colorway. It comes with a generous 400 yards too. 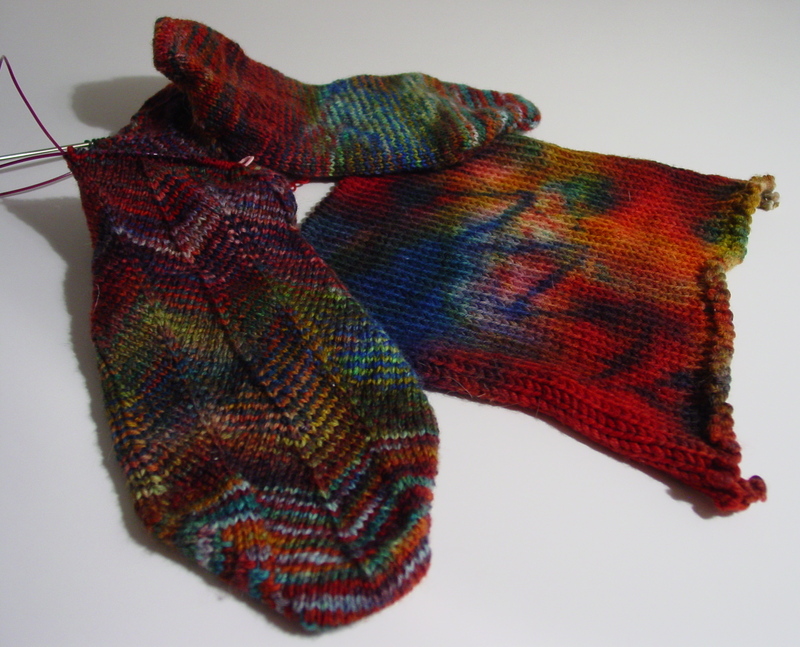 It will be a blast to knit up some bright socks and watch the pops of color materialize on the fabric… plus I can see what the craze is all about. The jury is out on whether or not this bright speckled yarn is up my alley. Brooke from Sincere Sheep has a truly amazing selection of yarn that is all naturally died. That’s color from plants people! She posted a picture of a this dye jar on Instagram recently, with a stunning sock blank inside soaking up a lovely ombre dye going from green to blue. I never wanted to knit from a sock blank until I realized that you could get 2 socks knit up at the same time with the same gradient/pattern. Unfortunately, they were all snatched up on the first night! I ended up grabbing a gauge square that will be helpful when making a sweater instead, and promptly headed to her website to sign up for her newsletter so that I can be the first in line to get her next batch of sock blanks. Alana Dakos from Never Not Knitting recently held a mystery knit-a-long which I had proudly draped over my shoulders when I went to her booth. It’s the Four Seasons Shawl pattern that I had literally finished the day before. She recognized it immediately and I was in awe of her talent to make up this beautiful pattern. I ended up getting a kids book called Annie and the Swiss Cheese Scarf, which both of my kids loved. It has instructions for little ones to learn how to knit including a story about a little girl who tried to learn, got frustrated and gave up, then re-tried one day and became triumphant. After I read it to my two children, my son asked if he could learn to knit! YAY! I also picked up a kids sweater pattern called Little Oak Cardigan. It comes sized for 6 month old babies to 14 years old! Quite the range. Last but not least, there is more neon in my life, in the form of fiber. I’m thinking of trying a new spinning technique to make the yarn thick and thin. It will make a cute chunky knit hat for my daughter, and possibly enough for a set of mitts too. This is 4 oz of Bluefaced Leicester, another new-to-me fiber that I can check off my fibers-to-be-spun list. I’m so excited to play with all my new fiber… but this makes me wonder. Am I a knitter or a spinner? I took home mostly fiber. Hmmm…. Did you get to go to a Stitches this year? What favorite things did you get?